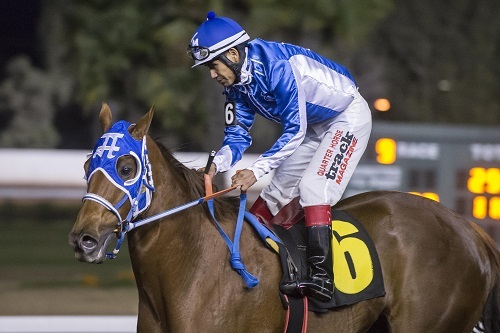 The year-long Quarter Horse racing season comes to a close this weekend at Los Alamitos Race Course with its two most important races of the year on tap on Saturday and Sunday night. On Saturday night, 2015 AQHA world champion Heza Dasha Fire will make his fourth start in the prestigious Grade 1, $600,000 Champions of Champions when he leads a stellar 10-horse field in the 440-yard race. Trained by Jose Flores for S-Quarter K LLC, Heza Dasha Fire has a spectacular history in this race. He won the 2015 running of the Champion of Champions and was second in each of the past two years. The gelding by Walk Thru Fire is one of the all-time greats in Quarter Horse racing and a nine-time Grade 1 stakes winner at Los Alamitos. A top five finish in the Champion of Champions would make Heza Dasha Fire the second richest Quarter Horse of all-time. A victory in the Champion of Champions on Saturday and he could have a chance to become the breed’s all-time leading earner in 2019 if he continues his amazing career. He’s one of only six horses to win back-to-back runnings of the Grade 1 Robert Boniface Los Alamitos Invitational Championship and one of only two since 1969 to win consecutive runnings of the Grade 1 Go Man Go Handicap. Heza Dasha Fire’s chief rival in the Champion of Champions figures to be Bill Hoburg’s BH Lisas Boy, who is a two-time Grade 1 winner in 2018 and a two-time stakes winner at 440 yards. Jim Walker’s Zoomin For Spuds, the winner of the 2016 running is another major contender in this race. He won the Grade 1 Vessels Maturity and looked powerful when prepping for the Champion of Champions with a victory in the first division of the Z. Wayne Griffin Directors Trials. Grade 1 winners Bodacious Eagle, He Looks Hot, Jess Ravin, Jesstacartel, and Tarzanito will be joined stakes winners LD Is Back and Yanque. Closing night of the Los Alamitos Quarter Horse meet is Sunday evening and it will be highlighted by the running of the Grade 1 Los Alamitos Two Million Futurity for juveniles. The fastest qualifier is Ali Babe Foose, who’ll be saddle by two-time Los Alamitos Two Million Futurity winning trainer Jaime Gomez. Powerful Favorite and Apollitical Pence, who have qualified to all three of the million dollar futurities at Los Alamitos in 2018, are among the other top rivals. Flash N Roll, who is undefeated in three starts at the Orange County track, is another major contender on Sunday. Wall calendars will be given away on Saturday, December 15 starting at 10 a.m. with a paid on-track admission and while supplies last. The new meet kicks off at Los Alamitos on Friday night, December 28. The Champion of Champions was first contested at Los Alamitos in 1972 when Mr Jet Moore edged champions Kaweah Bar and Charger Bar. Since then, 28 of its winners have been crowned World Champion by the AQHA, including the 2015 Champion of Champions winner Heza Dasha Fire. Easy Date, Dash For Cash, Refrigerator, SLM Big Daddy, Tailor Fit and Blues Girl Too are among the World Champions that have won the sport's most prestigious race for older horses.